The European Space Agency (ESA) produced 100 limited edition kits commemorating the flights of its Automated Transfer Vehicle (ATV) to resupply the International Space Station. Packed onboard Europe's final space freighter to dock with the International Space Station is a small blue box. It is not the most important payload onboard the "Georges Lemaître" — the name that the European Space Agency (ESA) gave its fifth and last Automated Transfer Vehicle (ATV) — but the box's contents represent the history that was made and the science that was advanced by the fleet of five spacecraft and their namesakes. The kit, which was developed by ESA's education office, includes embroidered mission patches and matching lapel pins for each of the ATV flights to the International Space Station, including the Georges Lemaître, which arrived at the orbiting laboratory on Tuesday (Aug. 12) carrying more than seven tons of fuel, supplies and experiments. With the exception of the mementos commemorating the first ATV mission in March 2008, each of the patches and pins for the four subsequent flights have the same design but differ in color. "Jules Verne, Johannes Kepler, Edoardo Amaldi, Albert Einstein and Georges Lemaître form the inspiration to explain the principles of physics for young and old," ESA wrote on its website, describing the videos. 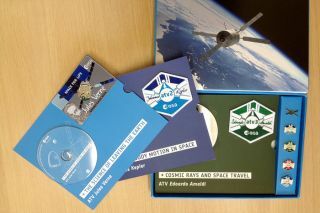 The box set launched to the space station is one of only 100 limited edition kits that were produced. ESA plans to further share the videos from the DVDs by posting them online during the Georges Lemaître mission. "Each ATV is named after a scientist or individual who fundamentally changed the way in which we understand the universe," said Anu Ojha, the director of education and space communications for the National Space Center in Leicester, England, as a part of his introduction to each of the videos. "And this series of films aims to examine the scientific breakthroughs and visionary concepts that made history." Beginning with Jules Verne, the pioneering French author of science fiction and namesake for ATV-1, the videos are themed around the scientific concepts that each luminary advanced. For Verne, who penned "De la Terre à la Lune" ("From the Earth to the Moon"), ESA's film focuses on the science of leaving the Earth. German astronomer Johannes Kepler's laws of planetary motion are represented on the set's second disc, devoted to "orbits and body motion in space" as they related to the flight of ATV-2. ESA's third freighter, named for the Italian physicist Edoardo Amaldi, is featured in a video about the science of cosmic rays and space travel. The film for ATV-4, the Albert Einstein, explores the iconic scientist's ideas about the "relativity of space and time." And finally, Belgian astronomer Georges Lemaître's early work on what would later be known as the Big Bang theory is represented in ESA's video about the evolving universe. Although not included with the box, ESA's education office is also introducing a new set of resources to compliment the kits. "Teach with Space" will offer demonstrations and guides intended to "bring the excitement of space into the classroom to inspire the next generation," according to the space agency. ESA is distributing most of the remaining kits to schools, but has set aside five of the boxes to give away online. To qualify for one of the limited edition kits, ESA is asking the public to create their own videos that both explain and demonstrate a law of physics, chemistry or biology and its relevance to space. The best five of the videos submitted through ESA's ATV website will win. "Ideally the demonstrations should be practical to recreate in a classroom or outside safely but if you happen to have an MRI scanner in your garage and think you can use it to demonstrate the existence of dark matter, by all means send it in," ESA advises. The deadline to enter the education challenge is Oct. 31, 2014. ESA is retiring the Automated Transfer Vehicle in favor of applying its two decades of design and flight experience to developing a service module for NASA's next-generation crewed space capsule, the Orion. The Georges Lemaître is expected to remain at the space station until Jan. 25, 2015, when it will separate from the outpost and be destroyed during its reentry into the Earth's atmosphere. Click through to collectSPACE to watch a video preview of the European Space Agency’s ATV videos.